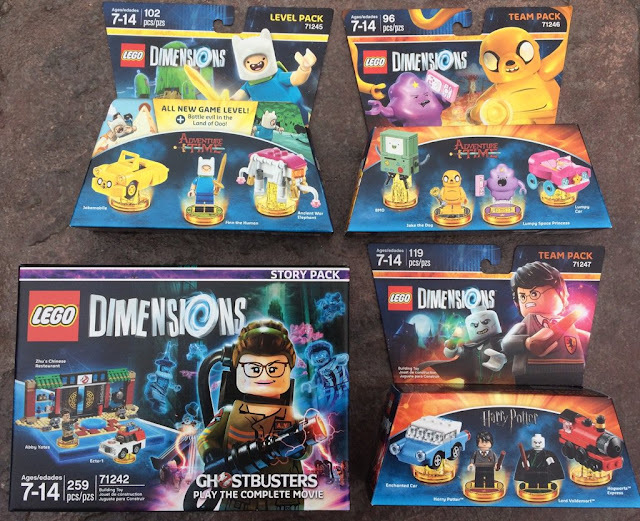 Hurrah, hooray, hurray -- a new wave of expansion packs for the LEGO Dimensions video game arrived at stores today! This is the sixth wave of new characters, levels and vehicles that expand upon the original LEGO Dimensions content. Now you can incorporate The A-Team, Adventure Time, Harry Potter, Mission Impossible and Ghostbusters into your game play experience. Warner Bros. Interactive Entertainment generously sent A GEEK DADDY some of these new expansion packs to play and I can't wait to rip open the boxes to try them out! Keep an eye out for future blog posts as A GEEK DADDY tests out and reviews the newest additions to the LEGO Dimensions video game multiverse. This new wave of expansion packs for LEGO Dimensions are the first to include the brand new Battle Arena feature that adds an exciting new dimension to the game playing experience. For the first time in a LEGO themed video game players can compete with up to four players in split-screen action within special Battle Arenas. Each Battle Arena has four gameplay modes: Capture the Flag, Objective, Base Bash, and Tick, Tag, Boom! Plus each Battle Arena contains its own traps, defenses, and special powers to make it unique. Players can compete in the Battle Arena gameplay modes in multiple configurations including 2 vs 2, 3 vs 1, or individually against one another or the video games AI allowing for family and friends to enjoy LEGO Dimensions together at once. Battle Arenas can be unlocked by obtaining golden tagged LEGO mini-figures that are packaged within LEGO Dimensions Expansion Packs beginning with the newly released sixth wave. A highlight of the new wave of expansion packs is the Ghostbusters Story Pack which allows players to relive the action of last summer's motion picture. 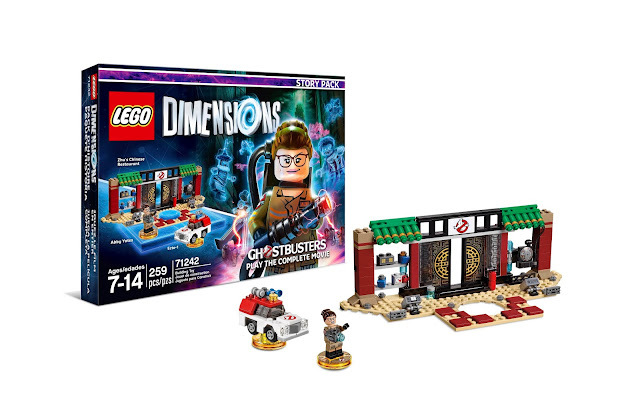 Help Abby Yates and her team of Ghostbusters save the world from the mysterious and evil ghost, Rowen, across six new action-packed levels of LEGO Dimensions play. The Story Pack unlocks "Rip," a new Toy Pad mode allowing players to tear open an alternate universe. In this mirror world, players have the ability to solve puzzles which have an impact on objects and other items in the primary universe. The Story Pack also includes a 3-in-1 buildable Ecto-1 car which can also be rebuilt into the Ectozer and PerfEcto. Additionally, the Zhu's Chinese Restaurant gateway can be built upon the LEGO Dimensions Toy Pad to customize it. Players can also access the new Ghostbusters free play Adventure World with its own unique Battle Arena by utilizing the gold tagged Abby Yates mini-figure included with the Story Pack. The Harry Potter Team Pack allows players to pit the boy wizard against he who shall not be named. 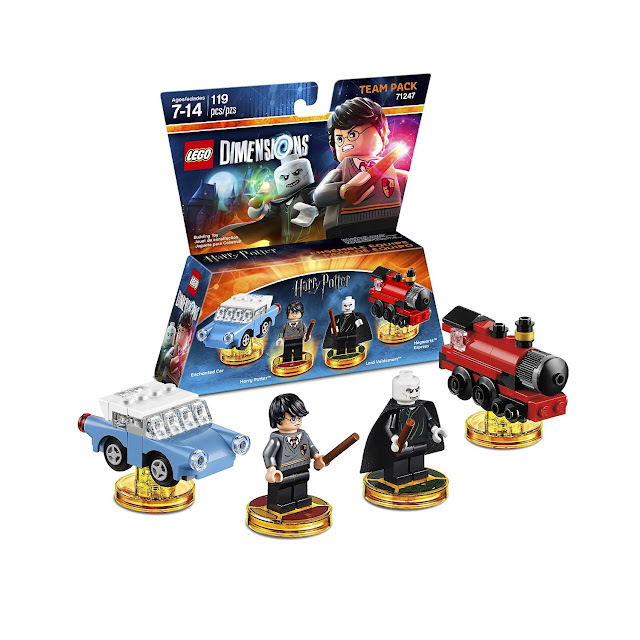 Harry Potter and Lord Voldemort LEGO min-figures bring the Wizarding World to LEGO Dimensions. Players can use Harry to cast magical spells such as Wingardium Leviosa, Stupefy, and Expelliarmus to solve puzzles and fight off Death Eaters or play as Lord Voldemort to utilize the power of Dark magic. 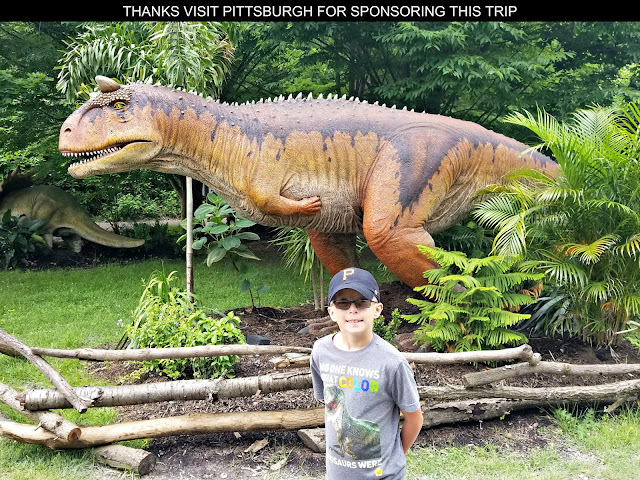 Players can also explore the Harry Potter themed Adventure World by jumping aboard the included buildable 3-in-1 vehicles of the Hogwarts Express (Steam Warrior / Soaring Steam Plane) or Enchanted Car (Shark Sub / Monstrous Mouth). Players can also use this Team Pack to engage in battles of good vs evil in the Harry Potter Battle Arena. 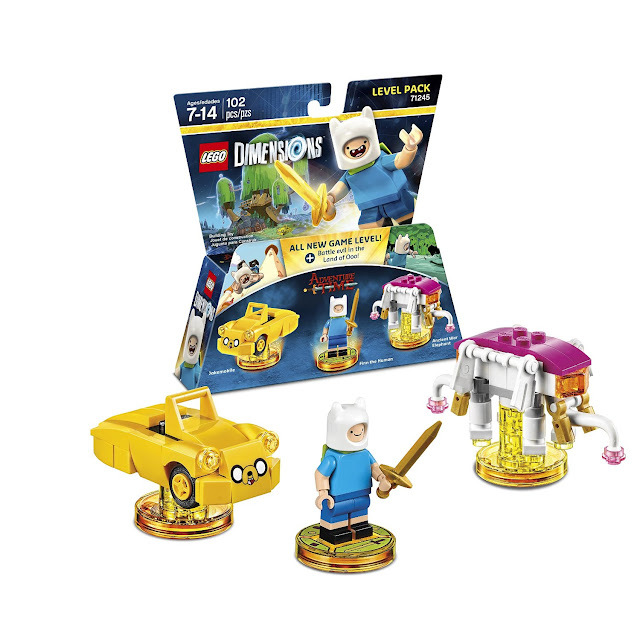 In the Adventure Time Level Pack, based on Cartoon Network's animated television series, players can help Finn the Human on his mission to find the Enchidrion and prove to Princess Bubblegum that he's a hero. Players can use on of Finn's many special swords to cut vines, grapple and even deflect lasers as they battle foes and travel through the Forest of Mount Cragdor, the Dark Magician's Brain World and more in this exclusive level available through this expansion pack. It also comes with a 3-in-1 buildable Jalemobile (Snail Dude Jake / Hover Jake) and 3-in-1 buildable Ancient War Elephant (Cosmic Squid / Psychic Submarine). Plus the pack allows players to unlock an Adventure Time themed Battle Arena. 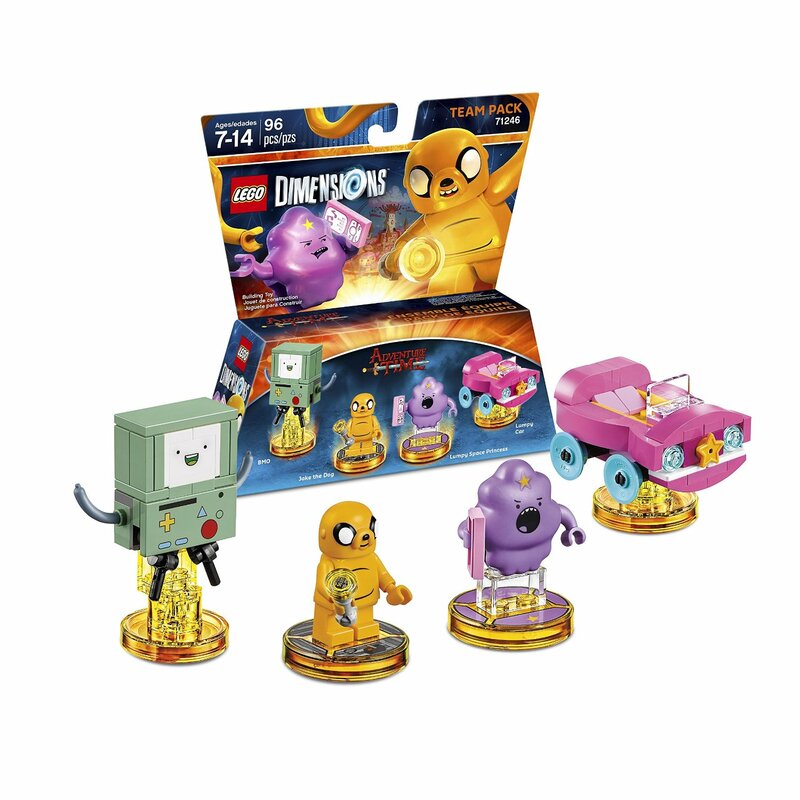 Fans of "Land of Ooo" can also pick up an Adventure Time Team Pack which includes LEGO min-figures of Lumpy the Space Princess and Jake the Dog that can be used as playable characters within the game. It also comes with a 3-in-1 buildable Lumpy Car that can also be transformed into a Lumpy Truck or a Lumpy Land Whale and BMO that can also be turned into DOGMO and SNAKEMO. It also provides access to the Adventure Time Battle Arena. LEGO Dimensions is available for PlayStation 3, PlayStation 4, Xbox 360, Xbox One, and the Wii U video game consoles. 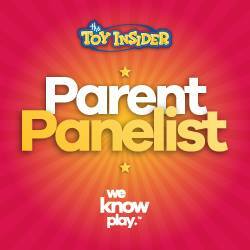 For more information, visit www.lego.com/dimensions. You can also follow the LEGO Dimensions through Facebook, Twitter and Instagram for tips on playing the game and updates about upcoming additions to it.